This is “Tempting Tutorials” round two! I’m loving that I can gather these ideas that I see everywhere in one place so I can refer back to them later. I sooo wish I was independently wealthy so I could sit around all day doing project after project, crafting awesomeness at every turn. Oh dreams.. Here are four very practical, simple and pretty tutorials to brighten up your lives. 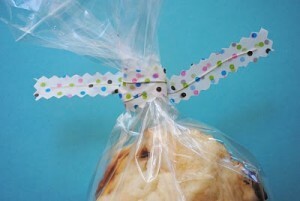 I REALLY want to go make these twisty ties right this second! This is such a simple tutorial with very pleasing results. A sandwich or lunch treat wrapped up and tied with one of these beauties is bound to make your day just a wee bit better, eh? All you need is some washi tape (Japanese masking tape), wire and pinking shears! Easy peasy. One of my favorite things is to send mail and give gifts. Postcards, handwritten letters, handmade birthday cards, crafted or sewn goods… I just love it! I’ve made many a’envelope from scrap paper and magazine pages, and I almost always make my own cards, bows and other gift-giving ephemera. 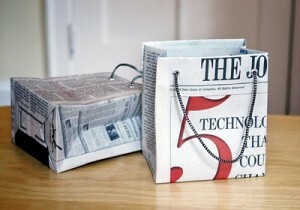 So I absolutely adore that you can make your own gift bags out of recycled materials and newspaper. A hole punch, some newspaper, some string and a small piece of cardboard will do it! 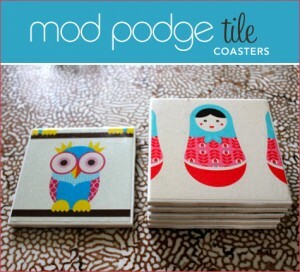 I’m a sucker for Mod Podge, but to tell the truth haven’t found my signature Mod Podge craft. My creations usually end up looking goopy and homemade frumpy, but I predict this tutorial could turn that around! I love the fact that you can use wrapping paper, newsprint or any other printed paper (besides ink jet prints). The options are virtually endless. Great ideas! I might try out the tile project cause we found a case of plain white tile in our shed when we moved in and we haven’t done anything with it yet. Thanks! !